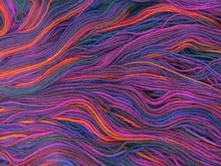 Mountain Colors Hand Painted Yarns: Only 9 more days!! The book Not My Daughter by Barbara Delinksy is being released on January 5th! In this book there is a group of women who knit and dye yarn. We have worked with Barbara to create a new colorway that celebrates these women dyers. We have been shipping it to yarn stores during the past month. The colorway is called "Spring Eclipse". Some stores already have it in stock. If your local store doesn't have it yet have them give us a call. We are offering it in all of our yarn styles and also in our Targhee Top. Won't it be fun to knit a project in Spring Eclipse while you are reading the book that inspired the color?! !